The Choir at St Andrew’s and St George’s West leads congregational singing at the 11.00am Service on Sunday morning and performs choral music for introit and anthem as well as choral motets during Holy Communion. The choir also traditionally sings for the Reflections in Advent and Lent and many special services during the year. The Choir has a wide repertoire ranging from the 16th to 21st century with a particular focus on newly commissioned compositions. The singers perform to a wide audience in Scotland and sing an annual concert in the Edinburgh Festival Fringe. They sing regularly for religious broadcasts for both BBC Radio Scotland and BBC Radio 4. Their Christmas Concert Carols at Six has become very much part of the festive Christmas music calendar in Edinburgh and always draws a large audience. The singers have travelled several times to Germany, most recently in 2015/16 for a New Year’s Day concert and services. In 2011 they visited Oxford, and in summer 2012 they performed a successful Jubilee Concert in Bishopsbourne near Canterbury. In 2013 they travelled to Malta to perform a concert in the famous Birgu Festival. Choir members range from the professional to the enthusiastic amateur singer with a number of student choral scholars among them. Brigitte Harris has directed the Choir at St Andrew’s and St George’s West since 2004. Rehearsals are Thursday 7.30-9pm and Sunday 9.30-10.30am. We regularly commission and premiere new music from young composers. In 2012 we gave the first performance of Andrew Carvel’s There is no rose and the first Scottish performance of Cecilia McDowall’s Ad lucem. 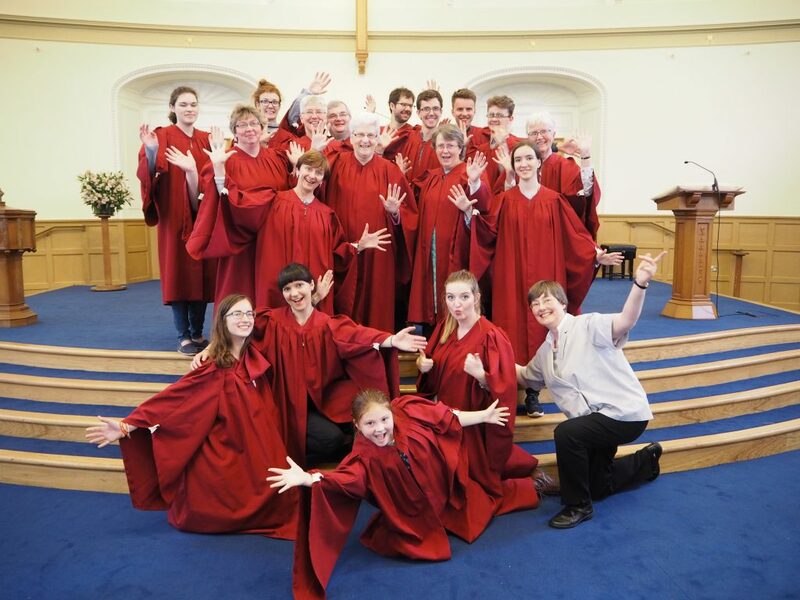 In 2013 we commissioned A Spiritual House from young Scottish composer Stuart Murray Mitchell to celebrate 150 years of worship in St George’s West. Stuart also arranged T’adoriam ostia divina, a favourite Maltese hymn, for our performance at Birgufest in Malta in autumn 2013. For our 2016 Fringe Choir Concert Sing Freedom, we gave first performances of two commissioned pieces: Little David, play on your harp by Stuart Murray Mitchell, and Sometimes I feel like a motherless child , by Andrew Carvel. 15 Hymns for Lent and Easter arranged by Brigitte Harris and Andrew Carvel, published by St Andrew’s and St George’s West Press and available from Brigitte Harris via the church office. For forthcoming concerts please see the what’s on section of the website. Anthems and introits at Sunday worship are publicised for 11am Sunday services, in the What’s On section of the website. Like to hire us for a wedding or other engagement? Contact our Director of Music, Brigitte Harris, via the church office.